Public health and hospitals being a State subject, the primary responsibility to ensure deployment of doctors and nurses at public health facilities lies with the State/UT Governments. However, under the National Health Mission (NHM), financial and technical support is provided to States/UTs to strengthen their healthcare systems including support for insourcing or engagement of doctors and nurses on contractual basis, based on the requirements posed by the States/UTs in their Programme Implementation Plans (PIPs) within their overall resource envelope. As the posts required for health facilities are filled up by respective State/UT Governments, they are impressed upon from time to time to fill up the vacant posts. Support is provided to States/UTs to strengthen their healthcare systems for providing accessible, affordable and quality health to all those who access public health facility. The Central Government is supporting States for provision of a host of free services including for maternal health, child health, adolescent health, family planning, universal immunisation programme, and for major diseases such as Tuberculosis, HIV/ AIDS, vector borne diseases such as Malaria, Dengue and Kala Azar, Leprosy etc. Other major initiatives for which states are being supported include Janani Shishu Suraksha Karyakram (JSSK), Rashtriya Bal SwasthyaKaryakram (RBSK), Rashtriya Kishor Swasthya Karyakram (RKSK), implementation of NHM Free Drugs and Free Diagnostics Service Initiatives, and implementation of National Quality Assurance Framework. 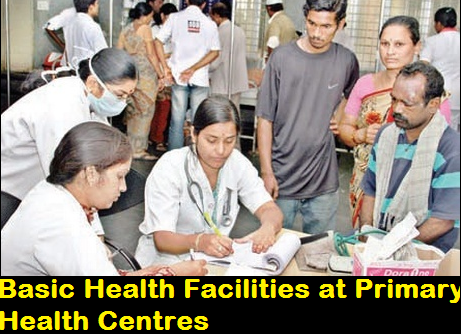 Public health and hospitals being a State subject, the primary responsibility to ensure availability of life saving drugs in public health facilities lies with the State Governments. However, under the National Health Mission (NHM), financial and technical support is provided to States/UTs for provision of essential drugs free of cost in public health facilities. To ensure free availability of quality drugs in public health facilities, support under NHM support is also provided to States/UTs for putting in place an IT enabled inventory management system to track drug availability. Public health and hospitals being a State subject, the primary responsibility to ensure availability of life saving drugs in public health facilities lies with the State Governments. However, under the National Health Mission (NHM), financial and technical support is provided to States/UTs for provision of essential drugs free of cost in public health facilities.